4.1 out of 5 based on 68 bloggers and 5 commenters. 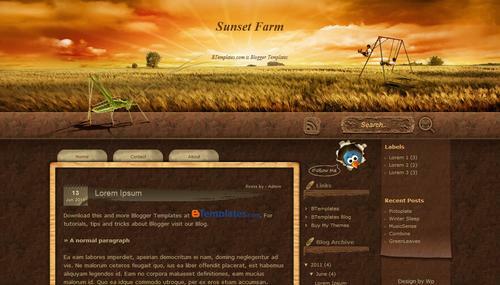 Sunset Farm is a free blogger template adapted from WordPress with 3 columns, right sidebar and rounded corners. I love this new template. Thanks so much for creating it. It fits my blog perfectly, especially for summer. And it downloaded without a hitch. Great template! Eu adorei esse template.É exatamente o que eu queria.Obrigada!